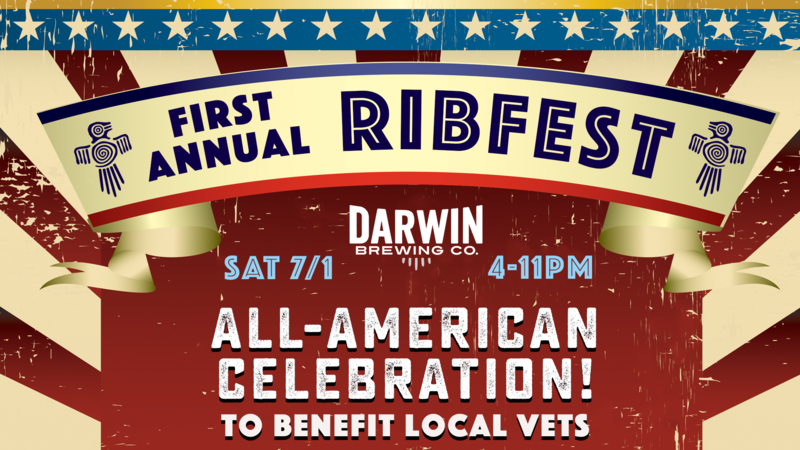 Celebrate our nation’s birthday with an All-American rib cook-off at Darwin Brewing Company! 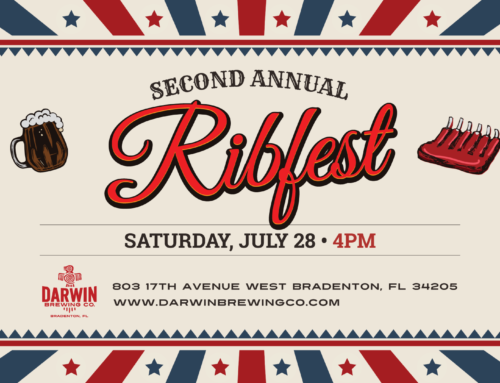 Announcing the first-annual Darwin Brewing Co Ribfest! 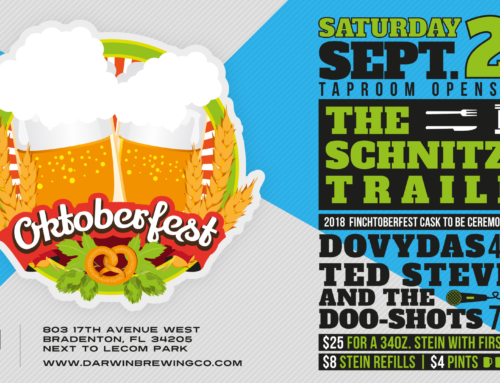 An amateur BBQ team competition, live music all day, patriotic costume contest, and of course… a full lineup of DBC craft brews perfect for pairing with summer barbecues. Not to mention, we’ll enjoy the fireworks spectacular scheduled to go off after the Marauders game at LECOM Park (~9:30p). Teams of amateur & professional BBQ chefs will be cooking up RIBS for our celebrity judges to “pick apart,” and Ribfest attendees can get in on the tasty action, too! Receive one sample from each team in exchange for a $10 donation, all proceeds donated to Turning Points Yellow Ribbon Veterans’ Program. Do you think your ribs will smoke the competition? Our competition is FREE to enter (you supply everything needed to make & serve your ribs)…. And the chef who creates the Best Overall Rib will win a $200 Darwin Brewing Company tab! Click to view official rules & register to participate. Must register by Wednesday, June 28. 4:30-5:45… Dan & Becca Shafer (The Dram) will open the show with a blend of violin and distorted guitar that walks the line between Southern Rock and Folk. 6:15-7:45… All Day Tuck combine acoustic melodies, warm string patterns, and rocking back beat rhythm, All Day Tuck keeps the listeners asking for more! 8-10:00… Have Gun, Will Travel have a natural instinct for combining folk, pop, rock and classic country influences to create a sound all their own. Guests can show his/her American spirit by donning an All-American costume for the costume contest Channel your inner Uncle Sam, G.I. Joe, the Statue of Liberty… heck, dress up like an eagle if that flutters your feathers! The Most Patriotic Costume as selected by our celebrity judges will win a 64oz. DBC growler & fill. We’ll also have a food truck or two on site, plus other vendors & kids activities will be announced soon. Across the street at LECOM Park, the Bradenton Marauders will be playing the Florida Fire Frogs at 6:30pm. They will have a patriotic themed jersey auction, free t-shirt giveaway to the first 1,500 fans, and spectacular post-game fireworks sponsored by our friends at Gold Coast Eagle and Budweiser. INTERPRETATION of RULES – The interpretation of the rules and regulations are those of the contest organizer and his or her decisions are final. 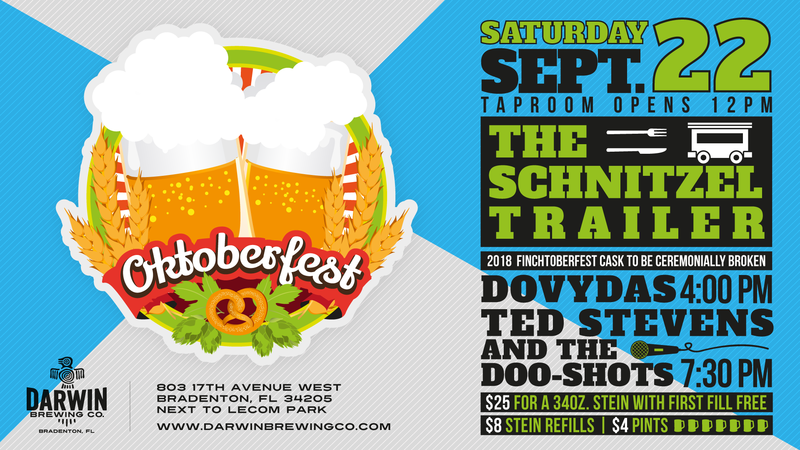 This is intended to be a fun, family-friendly competition in its first year at Darwin Brewing Company. Any complaints or disputes will be considered suggestions for improvement next year! 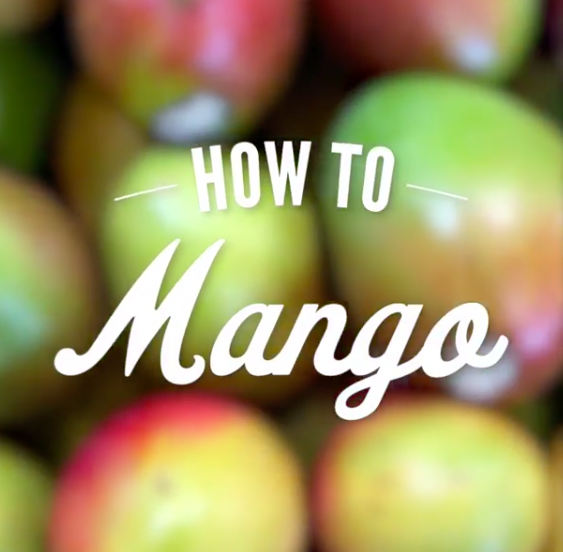 ENTRY FEE — No entry fee required. PARTICIPATION REQUIREMENTS — Rib Team must provide 105 bones of either baby back or St Louis-style ribs, a 10×10 tent with your own cooker*, one serving table (prep table optional) and all utensils required for serving – knives, tongs, etc. Official Team signage and decor encouraged! AWARDS — Two prizes will be awarded. 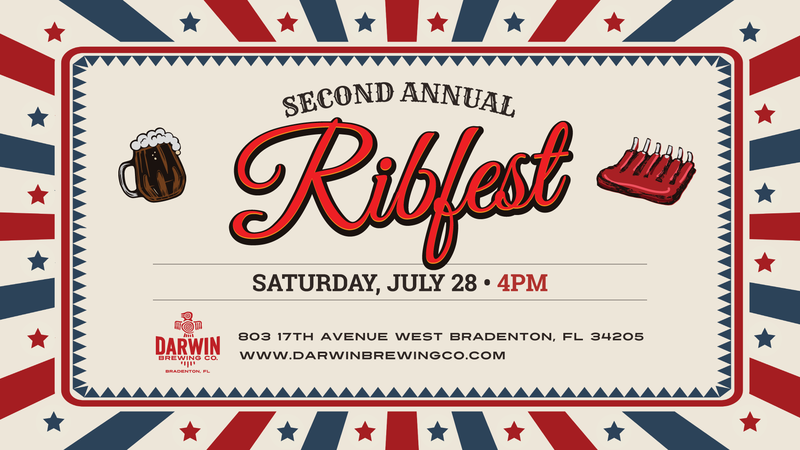 “Best Overall Rib” will be the first place winner and will receive a trophy and a $200 gift certificate to Darwin Brewing Company. 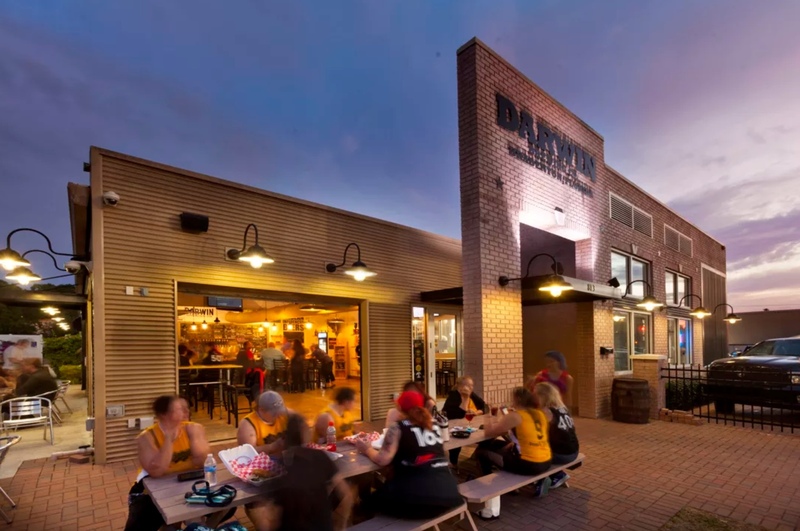 Second place will receive $50 gift certificate to Darwin Brewing Company. REGISTRATION — This Registration Form must be received no later than Wednesday, June 28. Event Organizer committee will contact Team Captain with load-in information at DBC Taproom before Friday, June 30. No grills or set-up will be allowed prior to designated set-up time which will be 6am on Saturday, July 1. ADVANCE PREPARATION — Should the Team choose to incorporate DBC beer into its rib recipe and cooking method, a 64oz. growler of the beer of your choice will be made available for pickup during normal Taproom hours on Friday, June 30 or at check-in on Saturday, July 1. 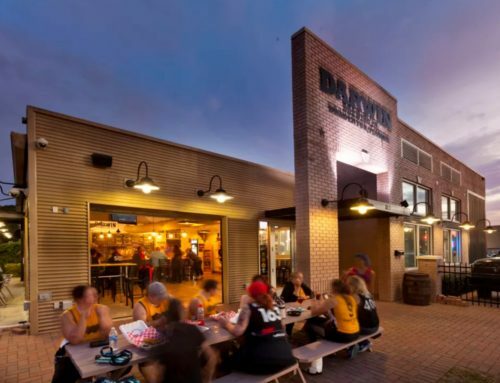 Teams *must* bring own growler or purchase one from Darwin Brewing Co.
CHECK-IN — All contestants must be set up and ready to cook by 12pm on Saturday, July 1. Teams are allowed to start/cook any time after check-in/set-up (6am) on Saturday, July 1 and up until cooking end time of 4:15pm. Check-in committee will verify number of ribs brought by Team exceeds 105 bones. Teams will receive their judges’ sample container and five free core beer coupons at this time, redeemable on Saturday, July 1 only. *COOKER – Each Team will supply all of the equipment necessary for the preparation and cooking of their entry including a cooker. COOKER can ONLY be one of the following: Charcoal, wood or propane fired device. (NO open/pit fires). The health and safety of contestants and festival goers should be a primary consideration when selecting appropriate cooking fuels. TEAM SITE – Each Team is required to keep all equipment including cooker, canopy, etc. contained within assigned 10×10 tent space. CLEANLINESS AND SANITATION – All Teams are expected to maintain their cook sites in an orderly and clean manner and to use good sanitary practices during the preparation, cooking and judging process. The use of sanitary gloves is required at all times while handling food. Failure to use sanitary gloves may result in disqualification. Grillers are responsible for cleanup of their site once the competition has ended. All federal, state and local food safety rules and regulations must be adhered to at all times. TURN IN TIMES – Cooking stops at 4:15pm and provided container with the 5 ribs for sampling will be collected by event organizers at that time. JUDGING – Entries will be submitted in the containers supplied by event organizer at check in by the Team. Only the entry to be judged is allowed in the container, NO SIDES. A minimum of 5 ribs in containers supplied to Team at check in, must be submitted for judging. Judging will be done in one round beginning at 4:30pm on Saturday, July 1. Each Team must submit 5 samples by 4:15pm in the containers given to them at check in. There will be a total of five local celebrity judges. JUDGES’ DECISIONS ARE FINAL. The winners will be announced around 6pm on Saturday, July 1. JUDGING PROCEDURE – The event organizer brings all approved containers to the judges. The containers will be passed around to the judges for sampling. The judge will then score each entry for PRESENTATION, TASTE/FLAVOR, TEXTURE, and BEST INCORPORATION OF DBC BEER. The event organizer makes sure that all scores for the containers are recorded in the proper place. 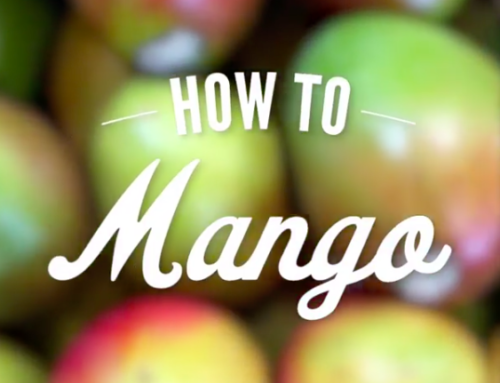 This procedure is repeated for all containers. The event organizer will then collect the judging slips and tally the points. SCORING – Scoring ranges from a low of 1 to a high of 5 in increments of 1 point for each category. Any entry that is disqualified as per the following section will receive a score of zero for all four categories from all five judges at the table. The total sum of points awarded in each category will be the Team’s overall score. People’s Choice winner with the most votes will receive an additional 5 points added to that Team’s overall score. DISQUALIFICATION – An entry can be disqualified by the event organizer only. An entry can be disqualified for any of the following reasons: a. The entry is turned in after the officially designated time; b. Gloves are not used while handling food products; c. Not cooking the meat that was submitted for judging; d. There is evidence of blood such that the meat is uncooked. GUEST SAMPLES — Once the judges’ samples are submitted, an announcement will be made to guests with sampling tickets that the ribs are ready for sampling. Guests will trade one ticket for one rib sample, with no exceptions. Sampling may continue until ribs are gone. WINNERS – The total sum of points awarded in each category will be the Team’s overall score. The highest overall point total will receive first place and the second-highest will receive second place. TEAMS may not sell any food items. Click to Register for Rib Cook-off!